I purchase the game, submit the order, download an install Impulse, enable "show pre-release version", but in I have not in "My Games" any beta version. Why? What I do wrong? You should have it when the new beta arrives. That could be tomorrow or a couple days. If you’re still playing Beta 3C, you should stop before it causes permanent damage (it’s pretty awful). to late for me... i have no feelings now. 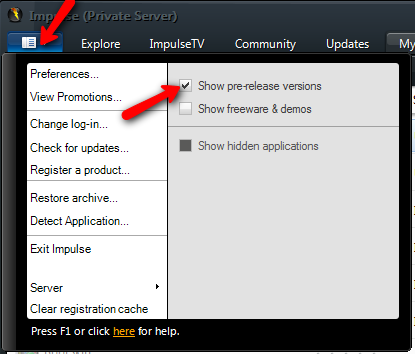 Note: You will be charged immediately for this product and gain access to Beta 3 via the Impulse client. The stability and performance of 3c may or may not make it pretty awful, but the intro cinematic more than makes up for it. I laughed my dorky arse off when I saw that. If he pre-ordered it on Impulse and has it set to show pre-release versions then it SHOULD show up on his games list. Downloading it is another story, took me about 10 resumes over the course of 6 hours to get the bloody thing. It would get to 7 percent... be sent the wrong file, fail, so I resume.. it starts over.. next try it might get as far as 20 percent before failing.. I resume.. and at least it starts at 7 percent this time! All of that to play a few minutes before performance went out the door and the game crashed, ehh, the intro made it all worth it! All of that to play a few minutes before performance went out the door and the game crashed, ehh, the intro made it all worth it! not for me the crashing and the bugs killed me mentally. I loved the intro. Can that be saved under a movies option somewhere please? I also just purchased the pre-order, but nothing is showing up, even with show prereleases enabled. Has Beta 4 not been sent to impulse yet? You missed the beta window.